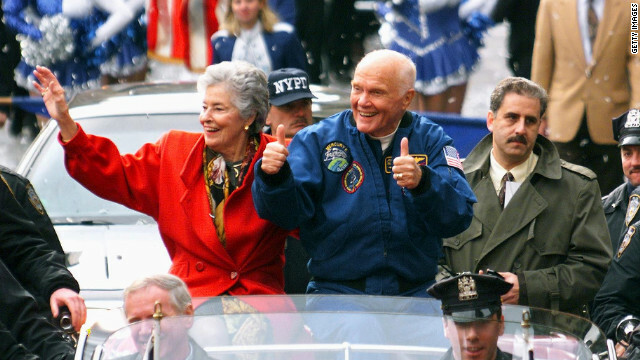 John Glenn and his wife Annie parade up Broadway's 'Canyon of Heroes' in November 1998. Editor's note: CNN contributor Bob Greene is a best-selling author whose books include "Late Edition: A Love Story" and "Once Upon a Town: The Miracle of the North Platte Canteen." For half a century, the world has applauded John Glenn as a heart-stirring American hero. He lifted the nation's spirits when, as one of the original Mercury 7 astronauts, he was blasted alone into orbit around the Earth; the enduring affection for him is so powerful that even now people find themselves misting up at the sight of his face or the sound of his voice. But for all these years, Glenn has had a hero of his own, someone who he has seen display endless courage of a different kind. John Glenn then Apollo 8 and Apollo 11, those were the days my friends!!! !